The packaging is fairly plain and unexciting. 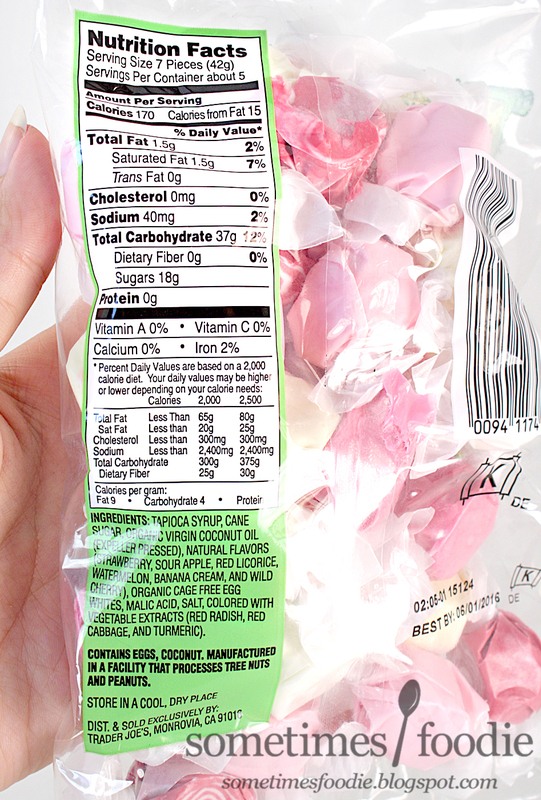 We have a clear heat-sealed plastic bag with some printing, and the design is a mash-up of classic old time-y candy wrappers and bright modern colors. It has that anachronistic issue that a lot of Trader Joe's packaging has, where it seems stuck between time periods, and no one time-related aesthetic seems entirely fleshed out. Sometimes that works, and sometimes it doesn't. This particular product isn't working for me, but it has potential. I like that the clear plastic allows you to see the colorful taffy bits inside and I love the colors, but the overall design and layout aren't strong enough to catch my eye. Thankfully the flavors inside are more interesting. We have cherry, strawberry banana, red licorice, sour apple and watermelon. Unless I'm missing something, there doesn't seem to be a theme to this mix. I originally assumed it was fruity flavors, but red licorice ruined that theory. Then I thought it might be summer or carnival themed, but that doesn't make sense either. 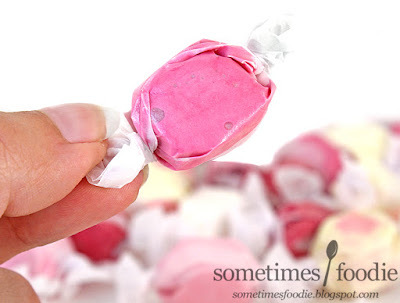 Even though this flavor mix seems a bit confused, I really wanted to see if Trader Joe's taffy could stand up to the handmade taffy I've eaten every summer since I was a kid. Let's find out! Watermelon (Light pink) - This was my favorite flavor in the bag. It was a little tangy, almost like eating watermelon too close to the rind, but it was delicate and refreshing. 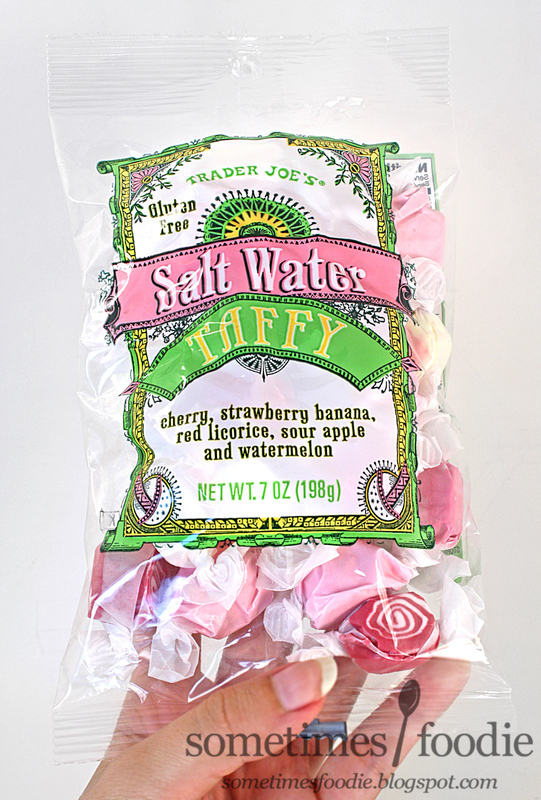 It's really interesting, and unlike any other watermelon flavored taffy I've ever had before. 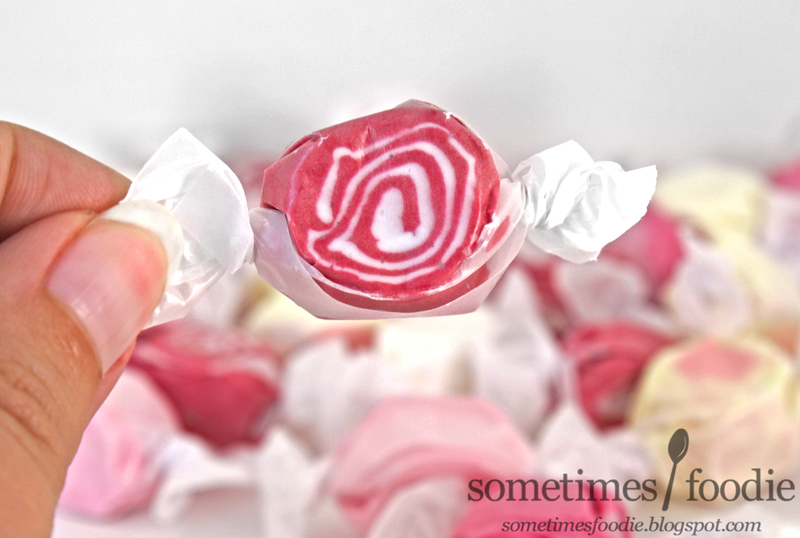 Red Licorice (Maroon with a white spiral) - Red Licorice flavored taffy? How cool is that? It's the number one reason why I bought the bag. (I was really hoping this would taste like the red licorice flavored Skittle from my beloved Carnival mix.) I popped it into my mouth, and it's licorice alright, but not the good kind. This is Twizzler/Haribo Licorice Wheel territory. It reminds me of a cheap strawberry flavored lip balm, and I was both impressed, and disappointed. It didn't taste the way I hoped it would, but it's surprisingly spot-on as far as waxy licorice goes. This was my other pick for least favorite, tied with the sour apple. Strawberry Banana (Yellow with a pink dot) - This one starts out sweet and mild, like banana creme, but quickly switches over to a tangy floral strawberry. The combination of the two flavors is really nice, but I was really hoping the banana would be more intense. Still, this was another bright and refreshing flavor, and it was really enjoyable. This was a really odd mash-up, and even though there were two really enjoyable flavors, it just didn't work for me. 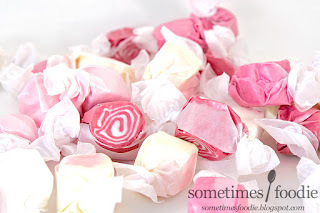 The texture was much softer and messy than what I'm used to, and when these were chilled in my fridge (to make eating them less messy) they kind of broke apart into taffy shrapnel. Which doesn't sound so bad, but the little bits got to room temperature really quickly and them re-goo-ified making it quite messy. Cybele didn't have this sticky issue on the West coast, so this might be due to the humidity in my area. 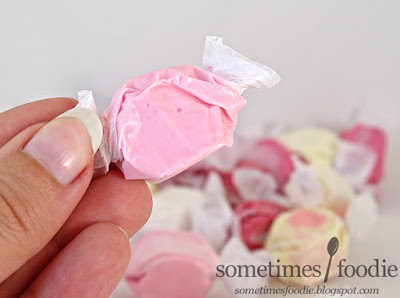 Even if that's the case, I live near the Jersey shore, so I have easy access to all kinds of taffy that won't leak and turn into a giant mess. This might be a good option for those of you who are landlocked without many alternatives, but I'll be sticking to the pick-a-mix on the boardwalk. This isn't a bad product, but I've had better. 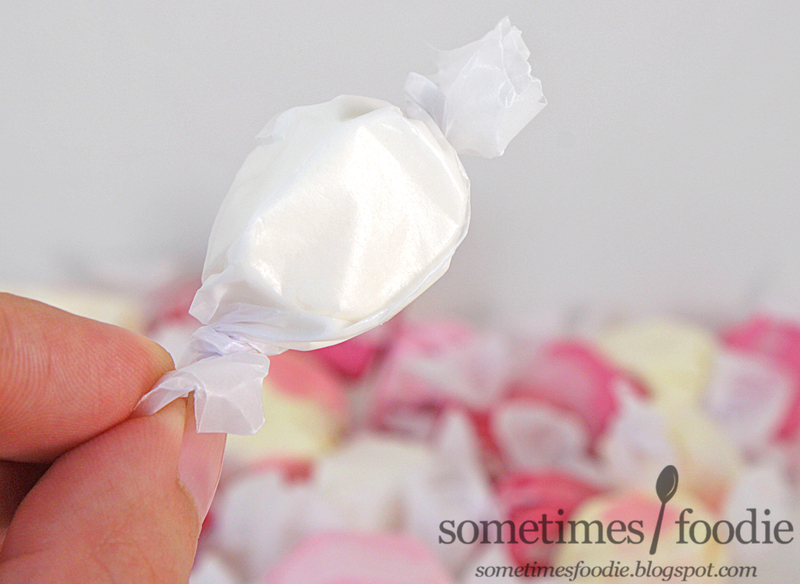 Have you ever had the salt water taffy at Wegmans? I really like the pear flavored (last year, they had my absolute favorite, but it didn't come back this year: cherry cola). When I'm down the shore, I usually get my salt water taffy from Laura's Fudge in Wildwood. 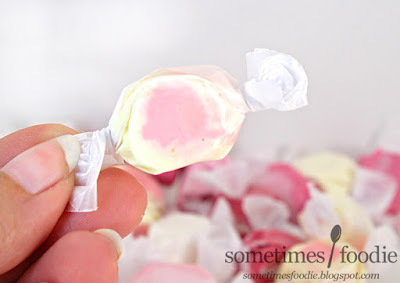 I haven't but a pear flavored taffy sounds really intriguing! ( I love pears!) I'll have to keep and eye out for it. Thank you so much! My co-workers love this taffy, but I was not interested in a game of taffy roulette! You saved some of us from the dreaded red licorice.